In the last few months, we’ve seen quite a few deals regarding the very first Honeycomb tablet in the Motorola XOOM, but with most of those sales, you were getting something refurbished – you know, something that was probably previously owned by someone. To make matters worse, there was that incident surrounding refurbished XOOMs that were improperly reset before being resold, thus, potentially containing the previous user’s information. Well people, this time around, things are a bit different seeing that daily sales web site 1saleaday.com is offering a brand new Motorola XOOM for only $334.98 total (that’s with shipping included). Specifically, you get the 32GB Wi-Fi only version of the XOOM, which is safe to say, a good enough deal taking into account that it’s brand new in the box – like never been opened or touched by other human hands. 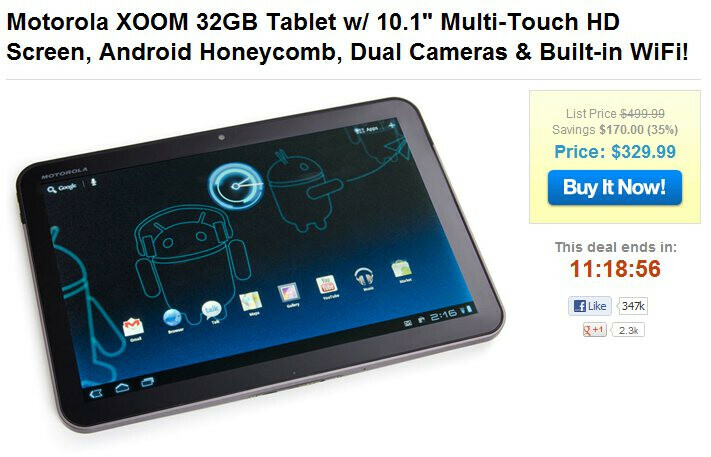 Despite not being the cheapest deal we’ve seen for the XOOM so far, it’s worth pointing out that this is the first time we’re seeing a great deal on a unit that’s brand new. Naturally, you can invest that moolah into something a bit more comprehensive in the specs department, but hey, it’s still decent enough when you factor in its tough construction, decent performance, and great price point. Therefore, if you’re itching to snag on this deal, you’d better do it before the clock strikes midnight – because like all the other deals on 1saleaday, it’s only valid for a single day. It has the newest update for ICS 4.0.4. It was the first tablet to get it. Crappy OS? Very good deal, but...nevermind...it is not called the iXOOM. Can this or will this be update to ICS??? It already has ICS 4.0.4, if that's what you are asking. Yeah, you can just update it to 4.0.4 when you get it. There's not too much of a difference anyways tho.. I use this more than my laptop. I have an ICS rom overclocked to stable 1.4ghz. also have USB mount app that i can plug my external HD over a OTG cable and able to watch movies from my external HD on my xoom. Yes, could be thinner but for 329, it is the best tablet out there for everything it does. 32 gig internal memory, 32gig sdcard expandable. external HD compatable and if thats not enough, you always got dropbox etc also spalshtop remote desktop and other apps. be godly if it could read cds. 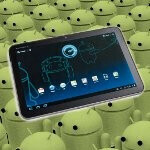 I bought the xoom four months after it came out and I still use it today. Its a worthy purchase and hell of a tablet considering that tablets with betters specs and offerings have come out since then. However, I don't think anyone should pay this much for the WIFI only version at this point when they can easily pony up a few more dollars and get something better.